I need blog ideas now! Yikes! Too much to choose from? Check out my post on how to strategically prioritize which topics to post about first! Don’t want to write them yourself? Love writing and can’t stop? Signing off and toasting: To NOT skipping scheduled content whenever possible! Originally published July 2017; updated with even more awesomeness May 2018. Let’s say you need a post in an hour. Your audience and subscribers rely on your regular display of expertise (a.k.a. blog). But, time is up, and you need content. Fast. 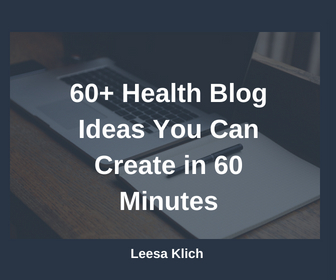 You’ve been overthinking your wellness blog ideas. Or not thinking about them at all. Now you’re stuck. Should you skip this week? Send it out late? Throw something together quickly? Buy a post you can instantly upload? HINT: Don’t skip. Consistency is key. You want your audience to see you’re reliable. Commit to a schedule and stick with it. Even if it’s not every week, or not the same length & format every week. First – Take a deep breath. You don’t need to start from scratch. Use the content you already have and re-purpose it. Here are a bunch of my best strategies for doing this. Create a quick blog post, video or audio answering one question from your audience. PRO TIPS ON VIDEOS: Video seems to be really hot now – especially live videos. A bunch of industry experts mentioned this in my Top trends for health & wellness content post last year. You don’t need pro equipment. You can shoot videos with your laptop camera or cell phone. For slideshows like in the courses I create, I use a free Zoom account to record a screen share with a small thumbnail of my face in the corner. Once recorded, download your videos to your hard drive and then embed into your blog. PRO TIP: Make sure you, download a copy to your personal drive – in case YT or FB goes wonky! Share tips – people love tips! Do you have a few tips that your clients love? Share them with your whole audience too. Things like how to swap a recipe ingredient, bust cravings, reduce sugar, relieve stress, or motivate yourself to exercise. How can your followers do something better or more efficiently? Bonus points for sharing a short story or example of how this tip can benefit them. Do you use lists in your own life? Share one. Maybe: grocery list essentials, what to pack when traveling, places you want to go this season, etc. What do you do when you’re bored? And why your audience should try it too. Start a 7-, 14-, or 21-day mini blog series where you share one tip, recipe, quote, thought, exercise, food/nutrient fact, etc. every day. And commit to following through. Write up or record a quick “how to,” demo, or tutorial. How to prepare a food, stretch, or meditate your way. Have a routine? What do you do every morning or evening? Do you do a weekly meal prep? Share it in a short post. Pros and cons post. Are you or one of your clients considering trying something new? What pros and cons should they think about before diving in. Any industry lingo that people are confused about? For example: probiotics vs prebiotics, kombucha vs kefir, weight-bearing vs non-weight bearing, etc. Explain it with a few examples for clarity. Post your latest recipe, favourite food, or move/stretch, along with a video or some pictures. Review a product you’ve used (i.e. supplement, app, workout gear, cosmetic, etc.). Review the book you’re reading or podcast you’re listening to. Bonus points if you want to add an affiliate or Amazon link to it in the post (just make sure it’s clear that you’re an affiliate, and you love and highly recommend the product). Have a wishlist? Include some of your favourite things as recommended gift ideas. Bonus points if you want to add an affiliate or Amazon link to it in the post (see point above). Here’s an example of my annual holiday gift guide. Have a few things you can’t live without? What are they? How do they help you? Bonus points for affiliate or Amazon links here too (see point 2). Have a few things you need to be premium quality, and others where discount is OK? Talk about them and your recommendations. What’s your favourite show, song, movie, TED talk, etc.? Why should your audience check it out? What benefits can they get? What’s the best or worst piece of health (or life) advice you’ve ever gotten? Why is it great/awful? No one asking you an obvious question? Ask, then answer. What are you eating or drinking right now? Take a photo and talk about some of the health benefits, or how to choose a good one, or how to prepare it properly. Who do you admire (historical or alive)? Why? What qualities and accomplishments do they have that inspire you? Here’s my hero, Dr. Semmelweiss, and how he was a badass to the medical establishment. Share an insight you’ve had recently from a book or conversation. Share a quick story about one thing that inspired you to become a practitioner. Is someone currently inspiring you? Share what you love about them, and how they’re helping you. Even announce what your inspiration has lead to (or is leading you to) do. Don’t forget to link to their site and tag them in your social media shares of your blog post (if applicable). 10 facts about you. Make sure at least 1 is quirky & shows off your personality. Share a recent story; for example, what you did on the weekend. And show how that aligns with your practice and why you do or don’t recommend it for your audience. # things you’ve learned since #. People want a personal touch. What makes you a better practitioner now? And how does that set you apart from your competitors? What motivates you to prioritize your health? How do you make it work? What challenges do you have and how do you overcome them? Do you support a charity or other cause? Talk about it, why you support it, and ask if your audience may want to help too. What’s your favourite quote and why? What significance does it have for you and why? What can your audience benefit from it? Embarrassing story? Epic failure? We’d love to know! What’s your opinion on the latest buzz? Is coconut oil really bad for you? Does clean eating really lead to orthorexia? I took on the “coffee causes cancer” BS in this post. PRO TIP: If you want to do a bit of research on this before writing it, it’ll take more than an hour. Either way, here’s my process for efficient researching. Is a holiday approaching? What should your audience do to make it their healthiest? Which health- and food-awareness dates resonate with you, your niche, and your target audience? No Diet Day? Hot/Iced Tea Month? International Hummus Day? What about International Chocolate Day? You can grab my Health- and Food-Awareness Dates Calendar with over 350 entries (and counting!). Have you recently been to an event? Are you planning on going to one? Share your learnings like I did about Canada’s new food guide here. Is it that time of year to set, or review goals? What goals have you accomplished and what’s next? Have a prediction about the health & wellness industry? Declare it, and why you think it’ll happen. Notice any trends lately? Loving them or hating them? Dish it out. What’s your “why?” Why do you get up every morning to help people? What do you love about it? What change do you want to make in this world? What special significance does your niche/specialty have in your heart? Make an announcement – Planning something special? Leave a hint for your audience and tell them to keep their eyes out for more. List at least one or two features (what’s in it) and benefits (how it helps). Here’s a post where I talked about how important it is to do your research before making health recommendations to clients. This led nicely into the new course I created. Don’t have a plan? Put one of your products on for a “flash sale” and announce it with your blog post. Share a client success story (don’t use their name without permission, of course!). Quickly write up a mini case-study showing how you’ve helped to improve his/her health. Tell people how to best work with you. What should they expect from you, and what commitment they need to make to be successful. Why you love being a practitioner. Everyone wants to know how much you love what you do. Talk about some of the features and benefits of one of your products/programs. Include a “buy now” button too. Won an award? Talk about how important it was to you and give a shout out to the sponsor. What are the main issues people come to you for help with? Talk about how those things impact their lives and how you help them. What does a day in your life look like? Share your schedule. Don’t have a regular schedule? What did you do yesterday? Call in your ideal clients. Be controversial and bold enough to resonate strongly with only your ideal clients (and allow your post to turn away everyone else). Describe what you love about them and why they are amazing for you to work with. Be ok to lose some subscribers and followers. Ask a question and have your audience guess the answer. Then, next week, reveal the answer and give a prize to the winner(s) (or everyone who guessed). Write a quick post to introduce a survey. Ask your audience their biggest challenge when it comes to their health. Ask them to email you with the answer and promise to read them all. You can (should) respond too! On the flip side, crowdsource advice. What can your audience give you ideas for or vote on? Already crowdsourced? Share your results in this week’s post. Have you guest posted or been interviewed lately? Share some thoughts about that experience and link to it so your readers can check it out. Share links to the best articles you’ve come across this week. Give each one a quick intro and why you loved it so your audience knows what to expect. Then tag the person so they feel your love. Who are your go-to resources? List your favourites (like I listed my go-to health research sites here). Bonus points for including a short intro for each one. Create a “Top 10“ list of your favourite recipes, restaurants, products, movies, books, apps, bloggers, social media accounts, YouTube channels, etc. Share link love. What are the best health & wellness spots in your city? Or a place you’ve traveled to? Make sure to include backlinks in the post for the people you’ve highlighted. Also tag them in your social media shares of your post. Want a freebie you can quickly re-purpose into a blog post? Download my free supplement resource “Before you buy another supplement – read this!” It contains 8 expert tips, with a focus on Canadian law. You can edit it and use it as you like. 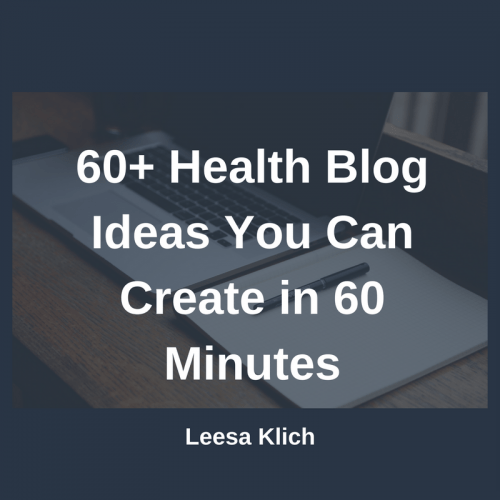 Want to publish expert health content in just a few minutes? Grab a pre-written blog post that you can customize and call your own. Here are my “done for you” health articles. And here are ways to customize them fast. My strategy is to pick one of these ideas and get your timer. Be sure to choose a topic that you don’t need to research. Something you know off the top of your head. Even though longer form posts will get you more shares & SEO juice in the long run; it’s OK to have some short posts on your site. Or in different formats. Minutes 10 – 40: Create. Go with the flow. Don’t stress over getting a minimum length. Right now you’re focused on quantity and reliably sticking to your schedule. Quality isn’t going to be 100% every time (unless you make it a huge priority or delegate it to someone else). Put something decent out there now, and use the steps below to make sure you don’t get into this situation often (or ever again). Minutes 40 – 50: Edit. Minutes 50 – 60: Final edit & publish. Of course, I have the same lame recommendation to plan ahead. You know, have a content strategy editorial calendar. This way you decide once per month or quarter what topics you’re going to blog/vlog/podcast about. And they’re going to be strategically planned to support and build your business. So, download my free content calendar now, put aside a couple of hours, and plan the next 2-3 months. Wouldn’t it be nice to not have to feel this way again for a few months? Want help creating your content strategy editorial calendar? You can get my help with your content strategy and editorial calendar here. Keep an idea bank. Every time you have an idea, jot it down. I personally use Google Docs on my phone which syncs with my computer. I can record ideas for my handy-dandy content calendar wherever I am. Keep an image bank. Do a regular binge on copyright-free images. Download them so you have a bunch ready to go. Bonus points if you organize by topic, e.g. food, fitness, lifestyle, etc. This way you only need to scroll through topic-related ones when you don’t have time. Here are some of my personal favourites – but before you download, make sure they’re copyright-free (things may change after I publish this post). Download the handy checklist of ideas from this post. Note your favourite ones, and keep it on-hand for the next time you’re in a pinch for content. Record your thoughts on an audio file and have someone create blog posts or slides from them. Send out a list of 5 questions to people you know and respect. Publish the questions and their answers as an interview post and tag them. Better yet, do an interview series where you profile someone different each week for # of weeks like I was interviewed here. Accept guest posts (the right way). Make sure your guests know in advance who your target audience is, and what benefits they can get from writing for your blog. Allow them a byline and at least one link to their site and social media profiles. Then make sure you promote, promote, promote it. I gave a few more detailed guidelines on the right way to ask guests to post here. Buy pre-written “done for you” health articles. I talk all about the pros and cons of DFY content in this post. You can see the articles I have for sale here. Outsource to a writer. I talk about what’s involved and how to hire and work with a writer here. If you’re inspired to keep creating, don’t stop at one. If things are flowing, don’t break the flow once you’ve met your quota. Keep going and finish another one or two posts. Here’s the secret: Don’t publish more than usual. Save any extra drafts you create for those weeks you’re too busy, taking a break, or just not inspired. Strategically planned high-quality niche-specific content is what I do and recommend; but, there are times we simply can’t. Use these super-quick ideas to fill in the gaps when you have to. It’s better to have a mix of blog post formats (long/short, written/video/audio, researched/opinions) rather than a “non-schedule” of erratic and unpredictable posting. What do you think? Which of these is your favourite? Did I miss any quick blog ideas? Do you have any comments or questions? Fantastic ideas, Leesa. I will be bookmarking this blog post for future reference when I’m feeling uninspired. Thank you! L-O-V-E this post so much. Thank you for taking the time to put together so much great information. I can’t tell you how many ideas I jotted down just reading through this one post. Love your content! Just love all the ideas. You explained it in a very simple way which is easy to understand. Keep posting such kind of stuff this will help a lot to those newbies like me. Thanks mate. You are very welcome Komal. Thank you for sharing!! Any ideas for great free downloads to capture emails? Thanks for sharing blog ideas. I really appreciate it. So glad to hear Hannah!